Wooden rat trap measures 7" x 3"
Nobody likes finding out they have rodents in their home, especially if you're planning on having people over. They get into your food and dig through the trash (sometimes at the same time), and they love darting out at just the right moment to make your guests squeal and jump up on the table! If you're hoping to have more parties in the future, then having rats is definitely not the way to accomplish that. Unless, of course, you're throwing a creepy haunted house themed party, and you want to gross out your guests. 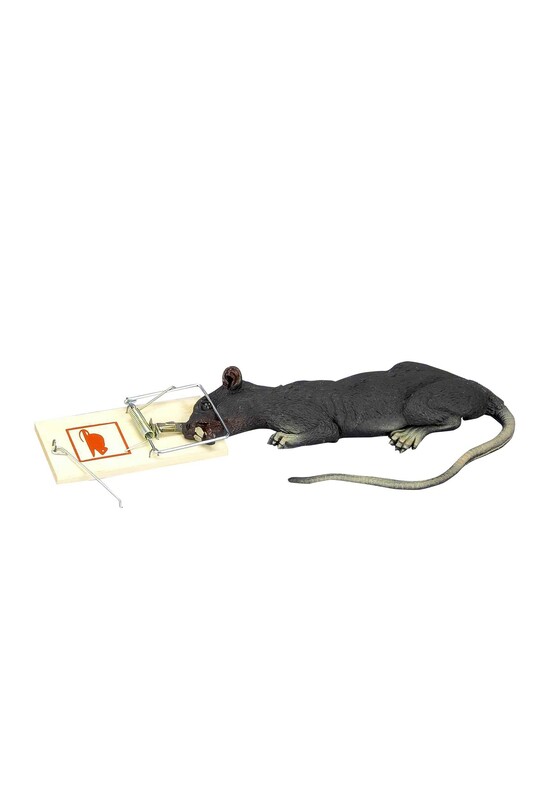 In that case, this Deluxe Rat In Trap /w Motion prop will give everyone the creepy crawlies! This poor rat's luck has run out, and has gotten its head caught in a wooden trap. Luckily, it's just made of molded vinyl, but its battery powered motor makes it realistically wiggle around when someone makes noise. This creepy little critter will be quite a startling surprise for any guests who stumble upon it!